I confess that I never go to the movies. Or maybe once a year - which is awfully close to never. It means that by the time the Oscars roll around, I've rarely seen any of the nominated films. 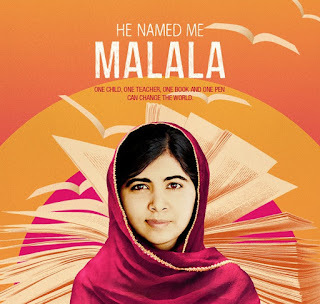 One movie that I missed when it came out - though it didn't get an Oscar nomination - is He Named Me Malala. I'm pretty happy that it's going to be on television next week, and at a reasonable hour so my twelve year old daughter can watch with me, and on a commercial-free channel so we don't have to DVR it to watch later. If you'd wanted to see it too, it's on on Monday February 29 on the National Geographic channel at 8:00pm (Eastern).